HTC Incredible (Droid Incredible) Coming April 29th (Image verification)? Ladies and gentlemen, could this be it? It looks like an official announcement to me! The HTC Incredible will be renamed and rebranded as the Droid Incredible by HTC. From the title of the image, you can see that “the next chapter in the Droid saga begins April 29th”. 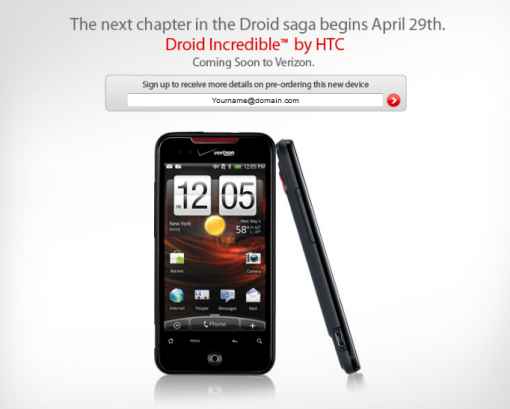 Does that mean that the Droid Incredible by HTC will actually be in the Verizon stores and on the shelf for purchase on April 29th? Everyone has been anxiously awaiting the release date for the HTC Incredible. There hasn’t really been too much talk about the renaming and rebranding of the name to Droid Incredible by HTC. Of course that new brand is probably directly influenced by Google ensuring that the name “Droid” appears somewhere in the name.